Stock up your bar, restaurant, or personal kitchen with this Choice 28 oz. stainless steel 3-piece shaker. Featuring a stainless steel construction, this bar shaker helps keep your cold cocktails chilled until served! By being able to shake up your cocktails with ice before serving, you guarantee a refreshing, chilled beverage each and every time no matter the original temperature of your liquor. Add this shaker to your bar supplies to ensure you have all the supplies you need without breaking the bank! Its 3-piece design makes this all-in-one item a necessity for your bartenders, as the shaker includes a cup base, strainer, and cap. This bar shaker does the job. We have had some problems with a few of them but overall they do their job. They are priced well y built with the right material. We will keep buying them. This is a wonderful stainless steel cocktail shaker! It fits quite a bit of liquid and ice so it is perfect to mix and make cocktails and mocktails in! works well. no leaks so far, and has been a great shaker to have in the bar. always nice to have in a set for those specialty drinks. Just got this shaker. It looks fantastic and works beautifully. And you cannot beat the price. It washes easily by hand or in the dishwasher. We use this product to mix all of our special tea drinks! We just add all the ingredients and shake away! Perfect fit for our coffee shop! A very nice and well made 28 ounce stainless steel cocktail bar shaker that is great for making martini and margaritas. The design is amazing and the quality is exceptional. Flavored iced coffee is lots of customers favorites. Serving a perfectly mixed flavored iced coffee is only possible with this shaker. Spoon is not working in ice. I love the size and simple style. I'm a heavy-handed pourer and these hold me over! My chief complaint is this did leak on me while shaking and I'm a bit disappointed. It has happened on multiple, inconsistent occasions. I'm a pretty fit 20-something male so fastening it tight enough shouldn't be the issue, but I'll keep an open mind for awhile longer. As mentioned, it's inconsistent so it might be me. We needed to add some cocktail shakers to our bar but we’re looking for smaller shakers. These were the perfect size and the price was just right! We use these shakers for bubble tea. I love how well they got together, however sometimes they aren't interchangeable...as in one lid wont fit the other shaker cup. It is ok, we just learned you cannot jam them together or they will hardly ever come apart without a mess! Otherwise they make super cold drinks and are great for our bubble teas. Much less expensive than the shaker cups for protein shakes which some places use. We ordered 4 of these. 3 were great, but the fourth is extra tight and we sometimes have to pry it open. We do like the size of these shakers and how easily they clean. This costs twice as much at my local restaurant store so I bought it here along with a few other things. It's of good quality and the lid and the top lid fits nicely and seals well when shaken. Simple, does the job. This shaker is exactly what we wanted. Sturdy construction, easy to clean, and best of all, looks good on a home bar counter! Built in strainer has pretty large holes, but I use a fine mesh strainer anyway. Awesome Bar Shaker perfect for my bartenders when they are serving a large crowd, nice weight and good solid material for handling and mixing drinks. I needed extra large shakers to make margaritas. At the cheap price I knew that they would not be the best quiality, however, I did not expect them to be completely useless This is what they turned out to be. The cover does not fit the shaker and if you force it on you cannot get it off. When using the shaker I got more margarita on me than in the glass as the drink flew everywhere as I shook the shaker. Save your money and buy a real shaker. If I could give it zero stars I would. DO NOT ORDER THESE! for any volume store. These are fine for at home bar shakers, not for commercial use. The lids immediately stick and impossible to pull apart. It leaks with simply shaking a 1 martini order. I ordered 3 of these shakers and they all have same issue. Great construction, i made the best drinks, real stainless steel, the size for large drinks or two drinks is perfect, i am really exiceted of this item!! This is a good shaker. Nice heavy stainless steel. It would be nice if all shakers had the same size tops though because the lids get mixed up and it is hard to find the one that fits. Work perfect for what we need. Ice does freeze to the sides pretty quickly but adding hot espresso bltakes care of that quickly. We ordered two and one I love and use every day with no leaks and no issues, the other one the lid fits so tightly inside the base that I practically need the jaws of life to get it out and when it’s does come apart whatever Ian inside ends up all over me and the wall. Great product. Price was amazing. Customer was very satisfied with this product. Most importantly, it does not leak when used, This item is highly recommended! Do not waste your money on this shaker. I bought 24 of these for my bar staff to use and they are absolute junk. After one use the lid sticks and is impossible to get back off. I wish I had bought just 1 to try it out before I spent all the money on 24 of these. I am honestly going to throw all of them away and have to buy 24 new ones for all of my staff. Absolute junk. Super thin metal. Tops are very difficult to remove and then leak. Complete waste of money - these went right in the garbage. 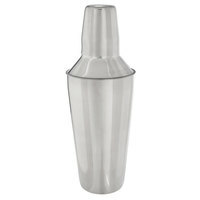 The large stainless steel cocktail shaker makes it easy for our staff to make a large portion of shots or martinis at one time. Very convenient! Great size shaker for a good size drink. Makes shaking a mixed drink soooo much easier. I love the shape of this mixer, every home bar should have one of these. So glad I purchased this shaker. I can honetly say theses were not good quality. We order a few and they stuck together.. my husband ended up bending it just to try prying the top off.. Will not order these again unfortunately. I wanted a decent size shaker that held up to frequent use and would not get banged up in every day operations. This does the job, and while not the best on the market, there is little to complain about. The only real complaint might be that the lip for getting the top section off is very small, so it can sometimes be tricky to get the two sections to separate. In the end it just takes a slight bump with a thumb or forefinger and they come right apart. I will order gain. very sharp looking item and gets the job done right. absolutely needed for every bartender to get that perfect mix of cocktails and other drinks. very reliable and durable item. The 28oz Stainless Steel Shaker works great in making Boba Tea for our customers. The syrup and tea mixes easily allowing for a great cold beverage everytime. This is a good shaker.. we like it a lot.. it is much easier than using the glass to shake the drink.. and there are lesss broken and chipped glasses now. Works very good. We used it a couple time last now to make a few different drinks and have really enjoyed it so far. Will get a lot of future use for sure! The 28 Oz. Stainless steel cocktail shaker is an excellent product. Whenever I prepare a drink it always keeps them cold for a very long time. I would highly recommend this product. Awesome product. Works as advertised, and suits my beverage making requirements. I've used it to make a few dozen drinks and I see absolutely not problem with the product. This is a nice bar shaker. Lid fits fine and no liquids escape. The only thing I wish it had was the rubber outer shell that other shakers have so it doesn't get so cold when you shake it. Sometimes I have to put it down as the shaker is unbearably cold. Good size shaker. It feels solid in hand and the lid fits tightly - almost too tightly. It's made a rather unpleasant sound the couple times i've removed the cap, but that should fade with use. Great value for the price! Unfortunately, either the cocktail shaker I received is defective or there is a major design flaw. The lid does not seal and the liquid spills upon shaking (tested by several people). What's more, at one point, the lid broke open during the shake and my bartender cut their finger on the rim. A great price on a 28 oz Stainless Steel Cocktail / Bar Shaker. Built in straining & removable lid make this a great addition to our bar area. Great inexpensive shaker. Our bartenders are happy with the simple design, and use them with ease. We set up many portable bars on our property, and they have made it through the packing and unpacking multiple times. We bought this shaker for iced coffee's/latte's for mixing and cooling the drinks. It didn't work as well as expected due to the milk foaming up. However that is not really what it is made for, but this works wonderfully without the milk and for mixing other drinks! This cocktail shaker is the best it has a built in strainer for straining the best mixes of all alcoholic beverages, I use it daily and have had no issues in fact its perfect and the best price out there. I would like them change the description to "The lid DOES NOT create a tight and secure seal to prevent spills and leaks." It spills like there's no tomorrow when i shake my drinks with it. Nice, durable shaker. Have not had any issues with leaking and is easy to clean. The shaker isn't anything fancy, but if you are looking for a standard shaker, the price is right. This is a great bar shaker for the money. Great quality, I've had it for about a year now and it has held up well. It's an easy way to impress your guests and look like a pro mixing drinks. I would definitely recommend this to a friend. Does exactly what I need it to and it's the optimal size for my needs. I like the simple look of it and it's a good tool to have around the bar! I love the slick look of this cocktail shaker. The stainless steel is easy to clean helps to chill the beverage since it gets much colder than glass! When I have the courage to show off my barista making/bar tending skills I always have the song "Tipsy" in my mind when I use because it is the real deal. The ice does not melt, I get a great consistency with the liquids I'm using, and if I time it right when I throw it the mix stays in. Love it?? High quality cocktail shakers. Solid and well worth the money. They even do well in the dishwasher and keep their shine after first use. We would definitely reorder these in the future. I purchased this due to it's large capacity whereas I can make two drinks at a time. I like the idea, however I found that the top sticks and is difficult to remove. It is well made. Not as great as a boston shaker, more pieces = slower and more to clean. Good for when a drink is prepared at the bar and poured at a table, good transporter. works well, one caution, do not tap the cup cap on to hard. It will take some real work to get it off so yo can use the pouring spout. This shaker looks great and works well, too! We love making drinks with this. The best part is the very low price! It is made well and looks like it will last us a long time. We have purchased this item many times. A simple item that works very well and looks good for a long time. The price is a good value. Looks like a nice shaker at a decent price but unfortunately no one could get the top off the shaker. Even ran it through the dish washer to try to loosen it up. Ended up just tossing it because it wasn't worth the hassle of a return. I was disappointed in this shaker, it was cheap so I should have know for the price it wouldn't last long. Bought it for our bar and it broke after just a few weeks. I was a little nervous when I ordered this shaker. I was pleasantly surprised to see that the lid does not get stuck nor does it fall out easily (perfect). The quality is great and I will be ordering more of these in the future. Wonderful product that has many uses and purposes from shaking cocktails to mixing fruit drinks! It looks very modern sitting in the corner of our counter and holds the liquid well! We are not happy with this product. It leaks when you pour. Even our most seasoned bartenders have trouble. We don't use the tops, we now use strainers. We Wont buy this item again. So far so good! Quality is good and the price is much better than the local place wanted! Thank you again Webstaurant Store! These are great shakers. They get extremely cold to touch, but that is ok. The tops actually work better than a lot of the others. They come off easier than most because they go in the shaker versus over the shaker. The size is perfect for making multiple drinks. I will be ordering these if needed. Our bartender loves it! After months of use, it doesn't freeze up and is a great size. The size is perfect for making two cocktails at the same time. It seems I got the one bad shaker out there. Mine came with a warped screener. Every time I pour from it, it leaks. I don't know of a way to straighten this out. Otherwise, I got fast service at a good price. In fact too good a price to bother to return it. This is the only cocktail shaker you will need. It is large yet comfortable to use and includes a strainer. It has an attractive mirror finish sure to fit in on any bar. The 28 oz. Stainless Steel Cocktail / Bar Shaker is great. It comes in three pieces, and has a mirror polished finish. It also comes with an ice strainer, and has a 28 oz. capacity. Great for any bar. Cocktail shakers are great to have especially in my household!! I usually go through them pretty fast but this one is very durable even for me, great buy!! A good, reliable shaker at a great price. This is the perfect size for mixing up larger drinks. You can save time by doing two at once. The three parts separate without a lot of trouble, making pouring and cleaning a breeze. Nice shaker cup. Heavy in weight and quality. I use these to make bubble teas and they work really well. We have several on hand at all times. Thunder Group delivers again on this awesome product. Cant beat the value in this Cocktail/bar Shaker. If you own a bar or a club or always having a party at your house this it the item to buy. These are great because you can mix up several martinis or cocktails at the same time. They also look a lot better than just using a speed shaker or a regular shaker. we use this to make cocktail or martini. they are easy to use and clean. they are sealed very well too when we shake it. No bells or whistles, it does what you would expect it to do. It is not double walled so the shaker itself gets extremely cold 2 seconds into making a cocktail. Not a big problem if you are only making one drink every hour or so, but if you are constantly using it for hours on end you will probably want to find a shaker that is double hulled. Large capacity makes mixing up 4 margaritas at a time feasible as long as you don't put in too much ice. I have purchased three other shakers in the past at retail stores and they have all failed me. Either they were leaking when trying to pour drinks or the caps would no longer fit. I have used this stainless steel shaker for over a month now and have not had any problems, even after running it through the dishwasher. Not to mention the price was great!!!! Every bar (commercial or home-based) need a shaker to do cocktails and mixes, and this shaker is the one to get. It is sturdy and quality-made. The price is excellent so it is a good value. The shaker is one of the most basic bar items on the markets, so it was a no-brainer for me when it came to purchase it. The description was very accurate.. I ordered eight of them for a martini party and they were the perfect addition to display the variety of drinks.